Discover Machu Picchu with AESU! The Inca Trail to Machu Picchu consists of three overlapping routes: Mollepata, Classic, and One Day. Trekkers wake before the sunrise and prepare for a day (or four) of indescribable adventure. Hike through cloud forests, alpine tundra, Incan ruins and tunnels, until the high peak of Huayna Picchu rises in the distance. Set your sights for 2020, and discover Machu Picchu on a guided tour with AESU! 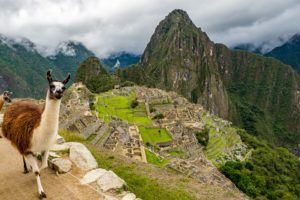 Due to the popularity of Machu Picchu, Peru’s Ministry of Culture announced changes to travel regulations and permits in 2017. In efforts to conserve the beauty and ecological integrity of the Inca trail, the Peruvian government limits the number of hikers each season. As a result, it’s important to book in advance and with a guided tour (such as AESU) that has the necessary permits. Whether you choose to partake in the one-day hike or the four-day excursion, it’s recommended to pack the necessities. Consider a set of trekking poles to assist you with the downhill portions of the route. If you don’t bring your own, you may be able to rent them in Peru. Layers are crucial to the local environment. You’re likely to experience every season on the trail to Machu Picchu, with cold winds in the morning and warm, bright sunshine in the afternoon. Even if you plan to travel in the summer, pack a light jacket and a couple of long-sleeved shirts. Lastly, pack a water bottle to stay hydrated throughout the entire hike! The trails are doable for all sorts of travelers, but preparing for the journey will help you enjoy every aspect of the adventure. Rather than riding the elevator at your work or university, take the stairs! The trail consists of stone stairs, much of which is original Inca construction. Taking the stairs will help to strengthen your knees and build stamina. On the weekends, get outside and go for a long walk! Every bit of preparation, no matter how small, will help you make the most of this once-in-a-lifetime adventure. Experience an exhilarating Peruvian adventure with AESU in 2020 (details to come soon)! In the meantime, check out all of the available trips for 2019! Follow AESU on Facebook, Twitter, LinkedIn, and Pinterest. 2019 tour dates and prices are available and selling out quickly! If you have any questions or want help booking your European adventure, please contact AESU by calling 800-638-7640, or fill out the contact form found on our website! This entry was posted on Wednesday, April 10th, 2019	at 9:52 am	. You can follow any responses to this entry through the RSS 2.0	feed. You can leave a response, or trackback from your own site.